Youth hostels were always international. In the years either side of the second world war young people went to France, to the Netherlands, to Belgium, Ireland, Norway and Germany. They went for leisure. They went for fun. Some went in the hope that their actions could create peace. They went to restore or reopen youth hostels. They worked with groups of other young people from other nations. They raised funds and sent paint. Supporters sent beds and bedding for hostels. When young people worked together in places recovering from famine and starvation after the war, they shared their rations. They paid their own way and their own living expenses. Noel Vincent was one of those volunteers. Vincent had led the work of creating a youth hostel at Leatherhead and then, after finding a derelict cottage on the Polesden Lacey estate in Surrey, he led working parties which built that hostel too. After Tanners Hatch finally opened in 1946, he went to Le Bez, in the French Alps near Briançon. He and others built the first youth hostel to open in France after the second world war. They got to the hostel on the back of a truck loaded down on its springs with people and bicycles. For the final stage they walked and supplies went by mule train with Algerian mule drivers dressed like the cast of the musical, The Desert Song. The hostel at Le Bez had once been a timber built mountain refuge with a stone cellar. Vincent and his colleagues converted old stables into a common room. They dug out the floor and reinforced foundations. It was the biggest job of a host of post-war volunteering projects. Work parties went from Britain to the Netherlands in 1946. They rebuilt the hostel at Arnhem damaged by British paratroopers in the battle there two years earlier. A work party went to Luxembourg and another to Italy, where a youth hostel organisation was just beginning. A work party went to Norway and finished work begun there by volunteers in the summer of 1939, just before the start of war. Volunteers also went to Germany to help rebuild youth hostels in the land of their origin. In 1947, as the allied authorities in Germany worked to recreate a democratic association, wardens from Germany came to England. They learned alongside wardens from youth hostels in England at a conference at Stratford -on-Avon. 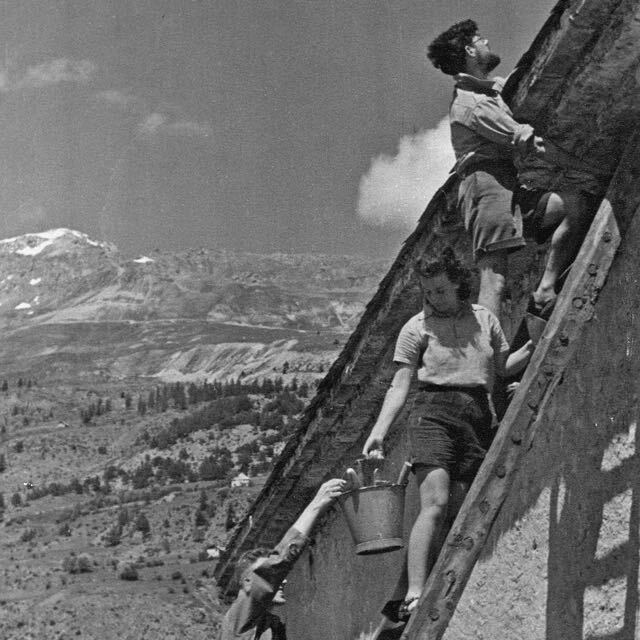 The first international working parties had been in 1934 when a group including pupils from Ackworth School in Yorkshire had created a youth hostel in France near Fontainbleu. In the following years, work parties went to Denmark and Ireland. Jack Catchpool, national secretary of the association in England and Wales, and president of the international association which bound youth hostels together, was adamant that the purpose of working parties was creating friendship among people. Catchpool was the instigator of these volunteering projects. He personally led many of the parties with his wife and children taking part too. He found the work that needed doing and then raised the groups of young people in Britain and further afield through colleagues in other associations. He believed youth hostels existed so that young people could get to know other countries and other peoples. The youth hostel in Norway at Mjølfjell that he and other volunteers worked on in 1939 and then again in 1946 is still open, a testament to the work of these international volunteers. The days of creating youth hostels by voluntary effort alone have gone. If you want to find out how and why, pick up a copy of Open to All and read about how youth hostels changed the world.